Although mahogany decks are very popular, many people do not realize that 95% of species in this category are not well-suited for exposed exterior use. Batu (red balau) is an exception. Batu, which means 'rock' in Indonesian, is far denser, harder and more durable than the red or dark red meranti and cambara which together make up most mahogany decking sold. Lesser types of mahogany should always be coated all sides with a protective stain before being installed. Batu is the one mahogany we are comfortable recommending for use coated OR uncoated. And with rich color and classic mahogany texture, you won't find a better looking mahogany than Batu. Though slightly more expensive than red meranti, the money is well spent. You get a naturally far sturdier and more durable product. Unlike other mahoganies, Batu also makes a good low-cost alternative to Ipe decking. The USDA Forest Service rates only the balau (batu) group "resistant or very resistant" to decay. 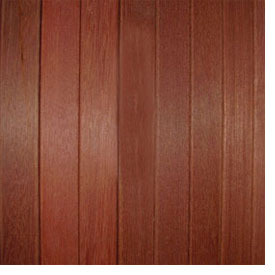 Standard red meranti is rated "slightly or nonresistant", like untreated pine. Batu's hardness, strength and bending resistance place it in a class of its own in mahogany decking. Batu is one of the very few wood decks of any species with a Class A flame spread rating, and is listed as such by the California Department of Forestry & Fire Protection.